Allport’s, Cattell’s, and Eysenck’s trait theories propose that individuals possess certain personality traits that partially determine their behavior. Traits are characteristic ways of behaving, such as extraversion–introversion: an individual may fall along any point in the continuum, and where they fall determines how they will respond in various contexts. Gordon Allport organized traits into a hierarchy of three levels: cardinal traits, central traits, and secondary traits. Using a statistical process known as factor analysis, Raymond Cattell generated sixteen dimensions of human personality traits, known as the 16PF. Eysenck’s theory of personality is based on three dimensions: introversion vs. extroversion, neuroticism vs. stability, and psychoticism vs. socialization. trait: An identifying characteristic, habit, or trend. Factor analysis: A statistical method used to describe variability among observed correlated variables in terms of one or more unobserved variables. Trait theorists believe personality can be understood by positing that all people have certain traits, or characteristic ways of behaving. Do you tend to be sociable or shy? Passive or aggressive? Optimistic or pessimistic? According to the Diagnostic and Statistical Manual (DSM) of the American Psychiatric Association, personality traits are prominent aspects of personality that are exhibited in a wide range of important social and personal contexts. In other words, individuals have certain characteristics that partly determine their behavior; these traits are trends in behavior or attitude that tend to be present regardless of the situation. An example of a trait is extraversion–introversion. Extraversion tends to be manifested in outgoing, talkative, energetic behavior, whereas introversion is manifested in more reserved and solitary behavior. An individual may fall along any point in the continuum, and the location where the individual falls will determine how he or she responds to various situations. Extraversion–Introversion: This image is an example of a personality trait. At one end is extraversion (with a preference for more stimulating environments), and at the other end is introversion (with a preference for less stimulating environments). An individual may fall at any place on the continuum. The idea of categorizing people by traits can be traced back as far as Hippocrates; however more modern theories have come from Gordon Allport, Raymond Cattell, and Hans Eysenck. Gordon Allport was one of the first modern trait theorists. Allport and Henry Odbert worked through two of the most comprehensive dictionaries of the English language available and extracted around 18,000 personality-describing words. From this list they reduced the number of words to approximately 4,500 personality-describing adjectives which they considered to describe observable and relatively permanent personality traits. Cardinal traits dominate and shape an individual’s behavior, such as Ebenezer Scrooge’s greed or Mother Theresa’s altruism. They stand at the top of the hierarchy and are collectively known as the individual’s master control. They are considered to be an individual’s ruling passions. Cardinal traits are powerful, but few people have personalities dominated by a single trait. Instead, our personalities are typically composed of multiple traits. Central traits come next in the hierarchy. These are general characteristics found in varying degrees in every person (such as loyalty, kindness, agreeableness, friendliness, sneakiness, wildness, or grouchiness). They are the basic building blocks that shape most of our behavior. Secondary traits exist at the bottom of the hierarchy and are not quite as obvious or consistent as central traits. They are plentiful but are only present under specific circumstances; they include things like preferences and attitudes. These secondary traits explain why a person may at times exhibit behaviors that seem incongruent with their usual behaviors. For example, a friendly person gets angry when people try to tickle him; another is not an anxious person but always feels nervous speaking publicly. Allport hypothesized that internal and external forces influence an individual’s behavior and personality, and he referred to these forces as genotypes and phenotypes. Genotypes are internal forces that relate to how a person retains information and uses it to interact with the world. Phenotypes are external forces that relate to the way an individual accepts his or her surroundings and how others influence his or her behavior. In an effort to make Allport’s list of 4,500 traits more manageable, Raymond Cattell took the list and removed all the synonyms, reducing the number down to 171. However, saying that a trait is either present or absent does not accurately reflect a person’s uniqueness, because (according to trait theorists) all of our personalities are actually made up of the same traits; we differ only in the degree to which each trait is expressed. Cattell believed it necessary to sample a wide range of variables to capture a full understanding of personality. The first type of data was life data, which involves collecting information from an individual’s natural everyday life behaviors. Experimental data involves measuring reactions to standardized experimental situations, and questionnaire data involves gathering responses based on introspection by an individual about his or her own behavior and feelings. Using this data, Cattell performed factor analysis to generated sixteen dimensions of human personality traits: abstractedness, warmth, apprehension, emotional stability, liveliness, openness to change, perfectionism, privateness, intelligence , rule consciousness , tension, sensitivity, social boldness, self-reliance, vigilance, and dominance. Based on these 16 factors, he developed a personality assessment called the 16PF. Instead of a trait being present or absent, each dimension is scored over a continuum, from high to low. For example, your level of warmth describes how warm, caring, and nice to others you are. If you score low on this index, you tend to be more distant and cold. A high score on this index signifies you are supportive and comforting. Despite cutting down significantly on Allport’s list of traits, Cattell’s 16PF theory has still been criticized for being too broad. Hans Eysenck was a personality theorist who focused on temperament—innate, genetically based personality differences. He believed personality is largely governed by biology, and he viewed people as having two specific personality dimensions: extroversion vs. introversion and neuroticism vs. stability. After collaborating with his wife and fellow personality theorist Sybil Eysenck, he added a third dimension to this model: psychoticism vs. socialization. According to their theory, people high on the trait of extroversion are sociable and outgoing and readily connect with others, whereas people high on the trait of introversion have a higher need to be alone, engage in solitary behaviors, and limit their interactions with others. In the neuroticism/stability dimension, people high on neuroticism tend to be anxious; they tend to have an overactive sympathetic nervous system and even with low stress, their bodies and emotional state tend to go into a flight-or-fight reaction. In contrast, people high on stability tend to need more stimulation to activate their flight-or-fight reaction and are therefore considered more emotionally stable. In the psychoticism/socialization dimension, people who are high on psychoticism tend to be independent thinkers, cold, nonconformist, impulsive, antisocial, and hostile. People who are high on socialization (often referred to as superego control) tend to have high impulse control—they are more altruistic, empathetic, cooperative, and conventional. The major strength of Eysenck’s model is that he was one of the first to make his approach more quantifiable; it was therefore perceived to be more “legitimate”, as a common criticism of psychological theories is that they are not empirically verifiable. Eysenck proposed that extroversion was caused by variability in cortical arousal, with introverts characteristically having a higher level of activity in this area than extroverts. He also hypothesized that neuroticism was determined by individual differences in the limbic system, the part of the human brain involved in emotion, motivation, and emotional association with memory. Unlike Allport’s and Cattell’s models, however, Eysenck’s has been criticized for being too narrow. The five-factor model organizes all personality traits along a continuum of five factors: openness, extraversion, conscientiousness, agreeableness, and neuroticism. Many psychologists believe that the number of human personality traits can be reduced to five factors, and that all of the other traits fit within these five factors. The five factor personality traits show consistency in interviews, self-descriptions, and observations, as well as across a wide range of participants of different ages and from different cultures. The acronym OCEAN is often used to recall the five factors, and comes from Paul Costa’s and Robert McCrae’s conceptualization: Openness to experience, Conscientiousness, Extraversion, Agreeableness, and Neuroticism . Critics argue that the five factor model is limited in scope and is not theory -driven; they also point to limitations in its use of factor analysis. neuroticism: A personality trait manifested by characteristics of anxiety, moodiness, worry, envy, and jealousy. Many psychologists believe that the total number of personality traits can be reduced to five factors, with all other personality traits fitting within these five factors. According to this model, a factor is a larger category that encompasses many smaller personality traits. The five factor model was reached independently by several different psychologists over a number of years. Investigation into the five factor model started in 1949 when D.W. Fiske was unable to find support for Cattell’s expansive 16 factors of personality, but instead found support for only five factors. Research increased in the 1980s and 1990s, offering increasing support for the five factor model. The five factor personality traits show consistency in interviews, self-descriptions, and observations, as well as across a wide range of participants of different ages and from different cultures. It is the most widely accepted structure among trait theorists and in personality psychology today, and the most accurate approximation of the basic trait dimensions (Funder, 2001). Because this model was developed independently by different theorists, the names of each of the five factors—and what each factor measures—differ according to which theorist is referencing it. Paul Costa’s and Robert McCrae’s version, however, is the most well-known today and the one called to mind by most psychologists when discussing the five factor model. The acronym OCEAN is often used to recall Costa’s and McCrae’s five factors, or the Big Five personality traits: Openness to Experience, Conscientiousness, Extraversion, Agreeableness, and Neuroticism. This trait includes appreciation for art, emotion, adventure, unusual ideas, curiosity, and variety of experience. Openness reflects a person’s degree of intellectual curiosity, creativity, and preference for novelty and variety. It is also described as the extent to which a person is imaginative or independent; it describes a personal preference for a variety of activities over a strict routine. Those who score high in openness to experience prefer novelty, while those who score low prefer routine. This trait refers to one’s tendency toward self-discipline, dutifulness, competence, thoughtfulness, and achievement-striving (such as goal-directed behavior). It is distinct from the moral implications of “having a conscience”; instead, this trait focuses on the amount of deliberate intention and thought a person puts into his or her behavior. Individuals high in conscientiousness prefer planned rather than spontaneous behavior and are often organized, hardworking, and dependable. Individuals who score low in conscientiousness take a more relaxed approach, are spontaneous, and may be disorganized. Numerous studies have found a positive correlation between conscientiousness and academic success. An individual who scores high on extraversion is characterized by high energy, positive emotions, talkativeness, assertiveness, sociability, and the tendency to seek stimulation in the company of others. Those who score low on extraversion prefer solitude and/or smaller groups, enjoy quiet, prefer activities alone, and avoid large social situations. Not surprisingly, people who score high on both extroversion and openness are more likely to participate in adventure and risky sports due to their curious and excitement-seeking nature (Tok, 2011). This trait measures one’s tendency to be compassionate and cooperative rather than suspicious and antagonistic towards others. It is also a measure of a person’s trusting and helpful nature and whether that person is generally well-tempered or not. People who score low on agreeableness tend to be described as rude and uncooperative. Agreeableness across the United States: Some researchers are interested in examining the way in which traits are distributed within a population. This image shows a general measure of how individuals in each state fall along the five factor trait of agreeableness. 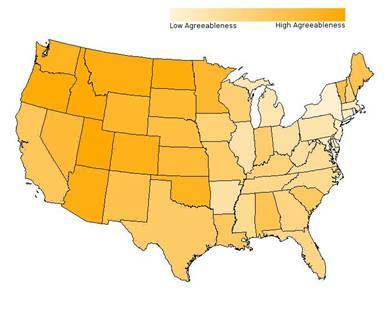 The Western states tend to measure high in agreeableness. High neuroticism is characterized by the tendency to experience unpleasant emotions, such as anger, anxiety, depression, or vulnerability. Neuroticism also refers to an individual’s degree of emotional stability and impulse control. People high in neuroticism tend to experience emotional instability and are characterized as angry, impulsive, and hostile. Watson and Clark (1984) found that people reporting high levels of neuroticism also tend to report feeling anxious and unhappy. In contrast, people who score low in neuroticism tend to be calm and even-tempered. The Big Five Personality Traits: In the five factor model, each person has five traits (Openness, Conscientiousness, Extroversion, Agreeableness, Neuroticism) which are scored on a continuum from high to low. In the center column, notice that the first letter of each trait spells the mnemonic OCEAN. It is important to keep in mind that each of the five factors represents a range of possible personality types. For example, an individual is typically somewhere in between the two extremes of “extraverted” and “introverted”, and not necessarily completely defined as one or the other. Most people lie somewhere in between the two polar ends of each dimension. It’s also important to note that the Big Five traits are relatively stable over our lifespan, but there is some tendency for the traits to increase or decrease slightly. For example, researchers have found that conscientiousness increases through young adulthood into middle age, as we become better able to manage our personal relationships and careers (Donnellan & Lucas, 2008). Agreeableness also increases with age, peaking between 50 to 70 years (Terracciano, McCrae, Brant, & Costa, 2005). Neuroticism and extroversion tend to decline slightly with age (Donnellan & Lucas; Terracciano et al.). Critics of the trait approach argue that the patterns of variability over different situations are crucial to determining personality—that averaging over such situations to find an overarching “trait” masks critical differences among individuals. Critics of the five-factor model in particular argue that the model has limitations as an explanatory or predictive theory and that it does not explain all of human personality. Some psychologists have dissented from the model because they feel it neglects other domains of personality, such as religiosity, manipulativeness/machiavellianism, honesty, sexiness/seductiveness, thriftiness, conservativeness, masculinity/femininity, snobbishness/egotism, sense of humor, and risk-taking/thrill-seeking. Factor analysis, the statistical method used to identify the dimensional structure of observed variables, lacks a universally recognized basis for choosing among solutions with different numbers of factors. A five-factor solution depends, on some degree, on the interpretation of the analyst. A larger number of factors may, in fact, underlie these five factors; this has led to disputes about the “true” number of factors. Proponents of the five-factor model have responded that although other solutions may be viable in a single dataset, only the five-factor structure consistently replicates across different studies. Another frequent criticism is that the five-factor model is not based on any underlying theory; it is merely an empirical finding that certain descriptors cluster together under factor analysis. This means that while these five factors do exist, the underlying causes behind them are unknown. While trait theories are useful in categorizing behavior, they have been criticized by a number of psychologists. The strengths of trait theories lie in their ability to categorize observable behaviors and their use of objective criteria. While developing their theories independently of each other, several different trait theorists have often arrived at a similar set of traits using factor analysis. Critics argue that traits do a poor job of predicting behavior in every situation. A counter to this argument is that trait theories provide a strong correlation for aggregate behaviors. Another limitation of trait theories is that they require personal observations or subjective self-reports to measure, requiring individuals to be introspective enough to know their own behavior. While trait theories provide information about how individuals may behave, they do not explain why they may behave this way. Factor analysis: A statistical method used to describe variability among observed, correlated variables in terms of a potentially lower number of unobserved variables called factors. introspective: Examining one’s own perceptions and sensory experiences; contemplative or thoughtful about oneself. observer bias: A form of reactivity in which an observer’s/researcher’s cognitive bias causes them to unconsciously influence the person(s) being observed/participants of an experiment. One strength of the trait perspectives is their ability to categorize observable behaviors. Researchers have found that examining the aggregate behaviors of individuals provides a strong correlation with traits; in other words, observing the behaviors of an individual over time and in varying circumstances provides evidence for the personality traits categorized in trait theories. Another strength is that trait theories use objective criteria for categorizing and measuring behavior. One possible proof of this is that several trait theories were developed independently of each other when factor analysis was used to conclude a specific set of traits. While developing their theories independently of each other, trait theorists often arrived at a similar set of traits. Trait perspectives are often criticized for their predictive value: critics argue that traits do a poor job of predicting behavior in every situation. Some psychologists argue that the situational variables (i.e., environmental factors) are more influential in determining behavior than traits are; other psychologists argue that a combination of traits and situational variables influences behavior. Such critics argue that the patterns of variability over different situations are crucial to determining personality, and that averaging over such situations to find an overarching “trait” in fact masks critical differences among individuals. For example, Brian is teased a lot but he rarely responds aggressively, while Josie is teased very rarely but responds aggressively every time. These two children might be acting aggressively the same number of times, so trait theorists would suggest that their behavior patterns—or even their personalities—are equivalent. However, psychologists who criticize the trait approach would argue that Brian and Josie are very different children. Another limitation of trait theories is that they require personal observations or subjective self-reports to measure. Self-report measures require that an individual be introspective enough to understand their own behavior. Personal observation measures require that an individual spend enough time observing someone else in a number of situations to be able to provide an accurate assessment of their behaviors. Both of these measures are subjective and can fall prey to observer bias and other forms of inaccuracy. Another criticism is that trait theories do not explain why an individual behaves in a certain way. Trait theories provide information about people and about which traits cause which behaviors; however, there is no indication as to why these traits interact in the way that they do. For example, an extroverted individual is energized by social interactions and seeks out social situations, but trait theory does not offer any explanation for why this might occur or why an introvert would avoid such situations. Limitations of the Trait Theories: While trait theories provide information about which traits an individual has and how they may behave, they do not explain why they will behave this way.